© 2011 SunSails All rights reserved. Sunsails are much more than shade cloth made up to size - in technical terms they are a tensile fabric structure, and as such comprise of components in different materials in different places to transfer the tension loads to the anchor points effectively. The shade sails all feature internal perimeter cabling, producing a catenary effect which serves to spread the shade cloth fabric evenly and minimise movement in windy conditions. The relationship between the ideal degree of fabric stretch, perimeter reinforcement length, curve deflection and anchor point position are pre-calculated and incorporated during manufacture so that the finished sail fits perfectly in position. Sunsails are the result of extensive development and trials to extract the maximum durability from the materials we use, and follow accurate manufacturing methods to produce shade sails of the highest quality. 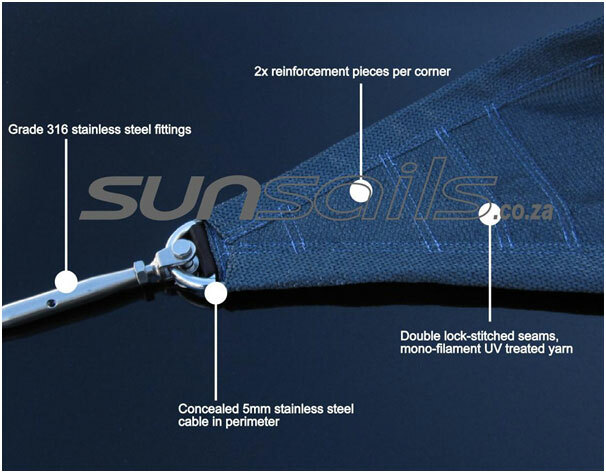 Where needed, poles can be used to provide additional attachment points to Sunsails Shades. Steel poles, capped and hot dip galvanised inside and out. Long lasting, and can be painted to match your existing colour scheme. Polished stainless steel, with a base and stainless stay cable. Slender and sleek, and matching the sail fittings. Ultimate durability, even in coastal areas.